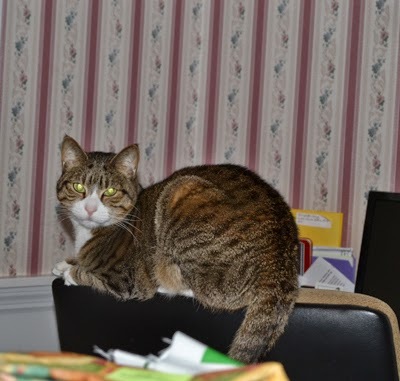 It is only fair to give credit to "my mostly companion and partner in crime"! I am facing the new year with resolve to finish my unfinished objects, or UFO's for short. Mind you, this goal might well take me my life time, but with exciting new quilt dreams in my head, it is likely the strongest motivator ever to make myself finish at least some of my old projects before tackling new ones. Here is the first UFO completed. Completed wool sofa quilt, primitively quilted with Sashiko Quilting thread. The blocks are uniformly sewn, but the different colors make each unique. 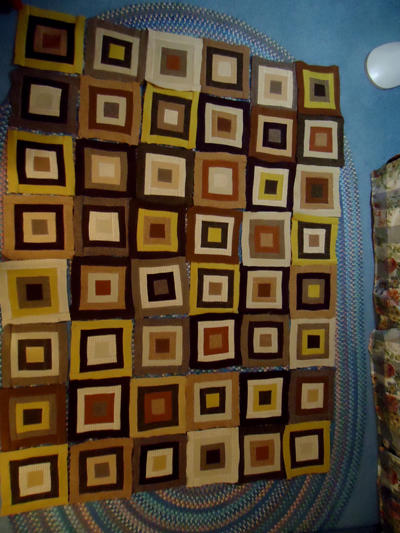 Remember when I first posted pictures of the log cabin wool throw, with its blocks spread out on my living room floor? I wrote a two-part series on Sashiko quilting in 2/27/12 and 3/3/12. I was excited about starting and finishing a pieced wool lap throw in a timely manner. It was moving along nicely, when Zelda, "my mostly companion and partner in crime" decided to hop on my dining room table where I had it spread out to quilt it Sashiko-style. It wasn't going to take me long, or so I thought. Zelda, however had other plans. 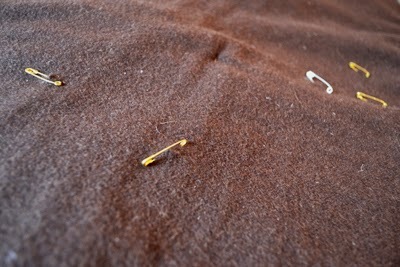 The front pinned to the dark brown wool backing, it is all ready to be quilted. 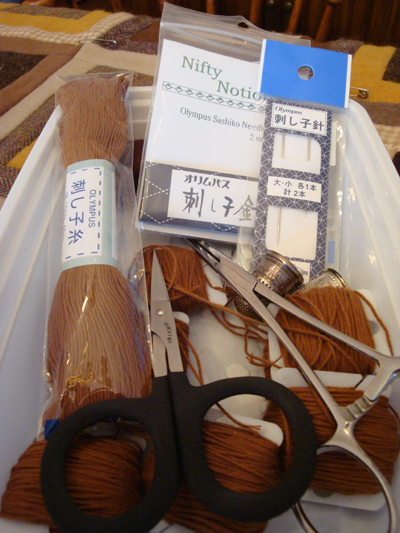 Sashido quilting thread and Sashiko needles, similar to darning needles. Sashiko quilting is more like basting...no 10-12 stitches/inch here! Zelda did what she does to things that she loves...she took a few little love nibbles on the back to mark it hers. They were very tiny holes, hardly to be noticed, but they were enough to stop my progress right then and there. I am a perfectionist and couldn't have holes in my quilt no matter that they were hardly noticeable. I knew they were there and that was enough. 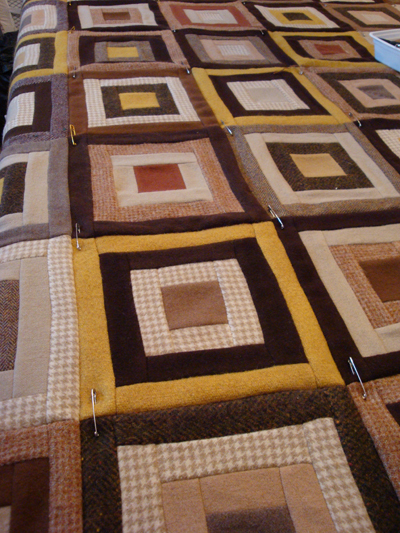 I marked the tiny holes with little gold safety pins and then picked up my log cabin lap throw and put it away. I needed to not over-react and kill Zelda and consider my options and I was in no mood to face the dilemma right then! Zelda's little additions...love bites, leaving tiny holes marked by safety pins. This is when real creativity begins. Anyone can plan and sew a quilt, but when something doesn't go according to plan creativity is taken to a new level. Then I remembered a quilt I had seen in a quilt show. The maker of it had noted some tiny puckers in the back and she did, just what I decided to do. She covered her imperfections with tiny appliqued butterflies and it got rave reviews at the show. Apparently the judges recognized what I am learning, that creativity begins when you want to scrap the whole project, but instead make the best of a bad situation. I planned an appliqued block to cover Zelda's additions. As I told the story about what had happened to this quilt, it seems that the quilt grew in value to animal lovers everywhere. The block now credits both Zelda and me and though I finished the new addition to the back and featured it in my 5/19/14 blog, I have just now finished quilting this quilt and appliqueing the credit block to the back and then hand stitched the edges turning the brown backing up and over the front edge, finishing it off by quilting around the border hem. The appliqued block not only covers the tiny holes but adds interest and a story to this piece. 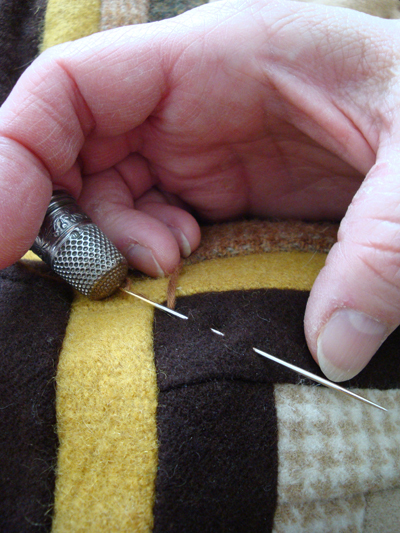 The appliqued block covers the tiny holes and gives credit where it is due. It is Zelda's first quilt and hopefully her last, but I decided to give credit where it is due. This block tells the quilt's story. 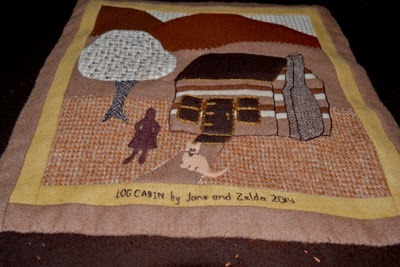 The Log Cabin is the quilting pattern used for the front, and my name and Zelda's are stitched along with the date the block was sewn instead of the quilt's completion date as was planned. Never mind that it is 2015 before I actually completed this quilt. One should never mark the ending date until the quilt is finished, but it did come close to being finished in 2014! I am now not leaving it out for Zelda to reclaim! It is hard to get the colors right in photos, but they are very rich indeed! It is for sale. It measures 50 inches x 66 inches, a good size to toast yourself as you sit and watch TV or read. 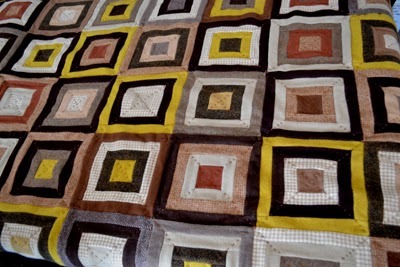 Please contact me at jmcvermont@comcast.net if you are interested in a quilt made by my dear Zelda and me. It is going to be her one and only quilt, if I have my way! She feels that her addition to the back should add to its value and is proud that she pushed me to new heights of creativity! It is made of recycled and new felted-wool and it is backed with a nice soft flannel style wool. It is made to keep someone seriously warm. It has no batting. The thick wools made it quite fluffy and plenty warm. Two layers of warm wool is more than sufficient to keep out the cold. 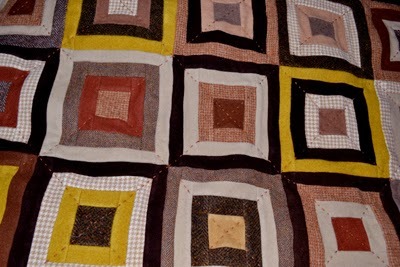 This is the first wool quilt that I have done and I learned later that wool quilts are common in Australia, but not so much here, though after I started this I began to see sampler style appliqued wool quilts at shows and I appreciated that thinner wools were usually used so the seams would lay flatter. I used a wool clapper when making the applique block to get my seams flatter but also used wools that weren't so thick for this block.. I really like the irregular, primitive look and the primitive Sashiko-style quilting was just enough to accent the blocks as well as effectively tying the front to the back. The wools are rich and handsome, and sadly any photographs don't do the colors justice. They are very rich! Zelda is quite proud of it and hopes that it goes to someone that will appreciate it as much as she did. And now I am onto completing my next UFO! Please contact me by leaving a message below or emailing me at jmcvermont@comcast.net if you are potentially interested in purchasing it.